The prestigious community of Scottsdale Ranch is composed of 1,119 acres and home to nearly 40 distinct subdivisions. The remarkable communities within Scottsdale Ranch encompass more than 4,000 gorgeous luxury homes and homesites varying in size and style. In Scottsdale Ranch you’ll find spacious townhomes, intimate patio homes, luxurious tennis villas and splendid single family homes for sale. This highly desired community is also home to an impressive 42-acre lake aptly named Lake Serena. Another noteworthy amenity of Scottsdale Ranch is its 64 acre public-use park. Scottsdale Ranch Park encompasses a long laundry-list of remarkable features including: 12 lighted tennis courts, 6 lighted volleyball courts, 4 lighted racquetball courts, 2 lighted basketball sport courts (half-size), a lighted basketball court (full-size), a lighted squash court and more! This amazing park is also home to the Desert Garden and its butterfly garden, hummingbird nest and saguaro sanctuary. Other wonderful advantages to living in Scottsdale Ranch include being served by the prestigious Scottsdale Unified School District and its top-rated schools. 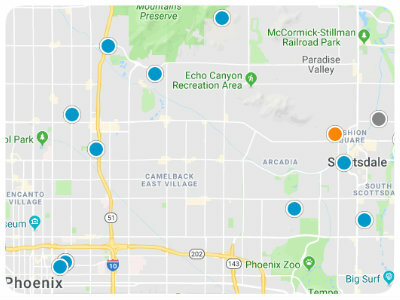 Residents of Scottsdale Ranch also enjoy close proximity to the The Mercado, a shopping area found in the southeast corner of Via Linda and Mountain View. Homes for sale in Scottsdale Ranch come in a broad price range depending upon whether the property is a condo, private patio home, custom lakefront property, townhome or single family detached home. Just a few miles from the Loop 101 Freeway, Scottsdale Ranch is prime real estate in Scottsdale. If you would like to buy a home in Scottsdale Ranch of Scottsdale, Arizona, please do not hesitate to contact us today.